A quality gamepad and a vast improvement on the 360 version. Now all we need is wireless functionality. Like it or not, gamepads have become an important part of PC gaming. Can you imagine playing Super Meat Boy or Street Fighter IV without one? 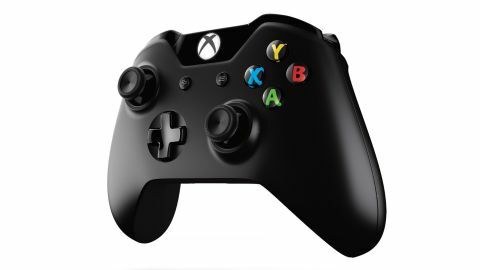 The 360 controller has been PC Gamer's go-to for years now, but yesterday Microsoft finally released Windows drivers for the Xbox One pad. I've spent the morning testing it out on a variety of games, which is both an excuse to spend my Friday playing games and an opportunity to tell you if it's worth upgrading or not. Everyone wins! There's no wireless dongle yet, so you'll have to attach the pad to your PC with a micro USB cable. Comparing the two, there's no real difference in weight or size. The Xbox One controller might be a little heavier, but it's negligible. Despite being almost exactly the same size, a sharper incline on the tops and handles means your grip fits around it more snugly—good news for people with smaller hands. It's made of the same mottled plastic, being slightly rough to the touch, but feels a bit smoother. In terms of holding the thing in your hands, they're both pretty similar. It's the buttons where you'll feel the biggest difference. The back and home buttons have been shifted down a little, but otherwise the layout is identical. The face buttons are closer together, bigger, and flatter, meaning you can press them with fractionally less effort. The D-pad is now a Nintendo-style cross that feels clicky and tactile, which is a major improvement on the 360's spongy, unresponsive circular pad. This is particularly useful for precise 2D platformers like Spelunky. The analogue sticks have changed too. After the D-pad, they're my favourite improvement. They're smaller, tighter, and have a pleasantly snappy springiness when you let them go. There's less resistance too, so it takes less effort—again, we're talking fractions here, but still noticeable fractions—to start moving your character/the camera/whatever. In summary: they're really nice, and you'll feel the difference the instant you start using them. I swapped back and forth between the two while playing Dark Souls II and Wolfenstein, and the Xbox One pad was the clear winner. Finally, let's talk triggers. They're no longer separated by an inch of space, instead forming one ergonomic 'lump' of plastic with a sliver of a gap between them. This makes the transition between the two more seamless. The bumpers have a more pronounced click when pressed and have more resistance than the old ones. The triggers are incredibly springy, and almost feel soft when you squeeze them. The controller I'm testing has had fairly heavy use since the Xbox One was released and doesn't seem to have lost any of its tightness or spring, but we'll have to wait and see how it fares after a year or so of abuse. Overall, though, the build quality is excellent. The only disappointment is the lack of haptic feedback. There are motors in the triggers that, whenever you fire a gun, are supposed to give you a tickly vibration in your finger. This works on games like Titanfall on Xbox One, but I couldn't get it to work at all on PC. Presumably their activation lies on the software's side, and games have to 'tell' the motors when to spin. Hopefully now that Microsoft have released these drivers, future games will account for this. Otherwise, functionality is the same. The regular force feedback is still there, and every game I tested—except Elite: Dangerous for some reason—recognised the controller as a regular 360 one when I connected it. Now that I've given it a thorough test run, I reckon I'll be upgrading to the Xbox One controller—if only for that lovely new D-pad. I play a lot of platformers and third-person games, which I prefer using a gamepad for, so I think it's in my best interests to get one. The controllers currently go for between £40 and £50 / $60, which isn't bad considering the quality. If and when Microsoft release a (no doubt overpriced) receiver that lets me play it wirelessly, it'll be even better.